Comments: A well-illustrated dark fantasy that still raises more questions than answers. Shadow Star first caught my eye almost a year ago, with its fine lines and soft watercolor cover illustration. The series is still as pleasing to view as it is to read, but it hasn't really progressed too much in the three volumes that have been released, so far. The book is about Shiina, a young girl who may not perform too well in school, but possesses a keen wit regardless of her scores. She's lived with her father most of her life, and only sees her mother once in a great while. After reading this volume, it's easy to see why she doesn't talk to her mother much. They met for Shiina's birthday, and her mother quickly went to work picking at the girl's self-esteem, accusing her of looking "miserably skinny" and then promptly asking for her grades. One quick look at Shiina's average marks and her mother essentially said it was apparent her daughter wasn't going to succeed in anything despite good genetic material from her and her father. Shiina's father, on the other hand, is an extremely modest, intelligent, and down-to-earth man. He was born on a small island and decided that the best way he could serve his townsfolk would be for him to learn how to fly a plane. That way, if anyone was seriously injured, they could be swiftly flown to an emergency hospital with better facilities than those on his island home. The only chance he had at becoming a pilot was to join the Japanese Self-Defense Force, so he served his time and then started flying "island hoppers," or planes that travel between the many islands of Japan. His inborn desire to help other people trickled down to Shiina, and luckily, so did most of his other positive personality traits. As a result of his time with her, she's a friendly, outgoing, physically able girl. She can be a bit too self-conscious at times, but that's mostly the fault of her mother. 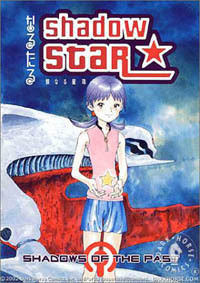 In the first volume of the series, a strange star-shaped creature rescues Shiina. While it is sentient, it does not talk to Shiina, though it does communicate sometimes through movement. She names the creature Hoshimaru and begins wearing it as a backpack. Somehow, Hoshimaru has the ability to change shape and the power of flight, so Shiina sometimes travels upon its back in times of great need. At first, life with Hoshimaru was wonderful. He was a friend unlike anyone she had ever met, and she always appreciates new friends. But then, other creatures started appearing, and they began to threaten the safety of her father's flying business. It seems as if the other creatures are also bound to humans, but the people they work for are not nearly as nice as Shiina. With such power under the control of malicious people, the entire world is being threatened by an enemy they cannot define -- and that they're unaware of. Shadow Star's story is very interesting, and I love the characters, but it moves rather slowly. This wouldn't be a problem if the release schedule wasn't so slow, but Dark Horse has yet to step up their release schedule like TOKYOPOP or Viz has done lately. I'd be extremely pleased if I could read a new installment of Shadow Star each month, but instead, I have to wait for the excruciatingly slow monthly comic book releases before each graphic novel hits stores. Hopefully, this will change soon. As I mentioned above, the art style is very distinct. Everyone in this series is tall and skinny, drawn with fine lines and precision. Since much of the story takes place in the air, there's not much background art here, but what does appear displays a great attention to detail. As can be expected from Dark Horse, there wasn't a single noticeable grammatical or typographical error in this release. Given the extreme amount of time between translation and release, this makes sense, but it's still nice to be able to read a book without being thrown off by an odd spelling here or there. The translation reads smoothly, but there's not much dialogue in most of these volumes. This is especially true in the scenes showing the flying creatures as they encounter planes in the air, for the creatures do not talk. While I'm slightly annoyed at having to wait for new volumes to arrive, I believe this series is worth the delay. Besides having interesting characters and a unique storyline, it's well-drawn and not as expensive as other manga its size. I may gripe about a few things here and there, but I'll still buy the next volume the day it comes in. If you're a fan of fantasy and science fiction, then perhaps you should too.